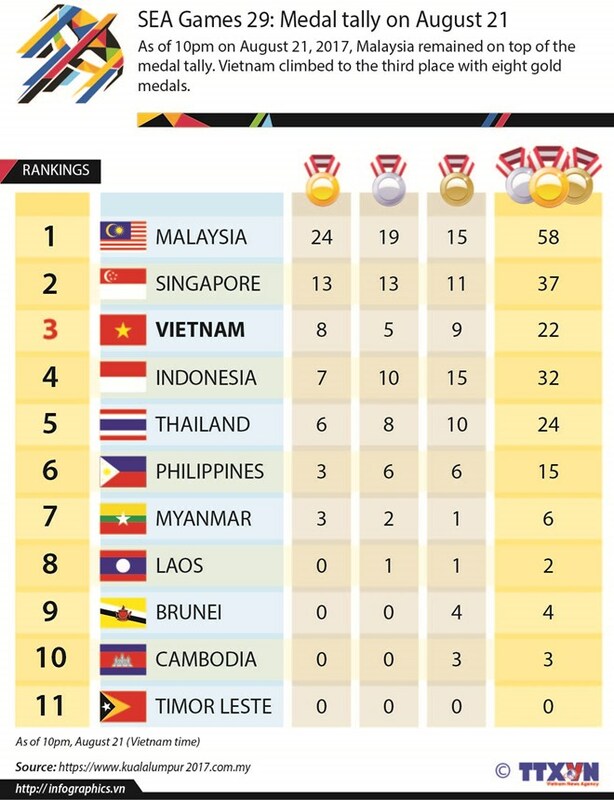 Kuala Lumpur (VNA) – Vietnam was ranked third in the medal tally as of the end of August 21, the second official competition day at the ongoing 29th Southeast Asian (SEA) Games in Malaysia. The spot was secured after Vietnam bagged four more gold medals in swimming, sabre, cycling and wushu, bringing its total gold to 8. The country also earned a total 5 silver and 9 bronze medals. Malaysia remained on top of the tally with 24 gold, 19 silver and 15 bronze medals, followed by Singapore (13 gold, 13 silver and 11 bronze medals).